Phi Theta Kappa honor society welcomed new members on April 12. PTK recognizes academic achievement among community college students. Forty-five students at College of the Mainland were welcomed into the Sigma Delta Chapter of Phi Theta Kappa honor society. An induction ceremony was held on April 12 at the COM Conference Center. Phi Theta Kappa is an honor society recognizing the academic achievement of community college students. To be eligible for membership, students must have a grade point average of 3.5 or above and have at least 12 college credit hours. Once a member, a student must maintain a GPA of at least 3.0. 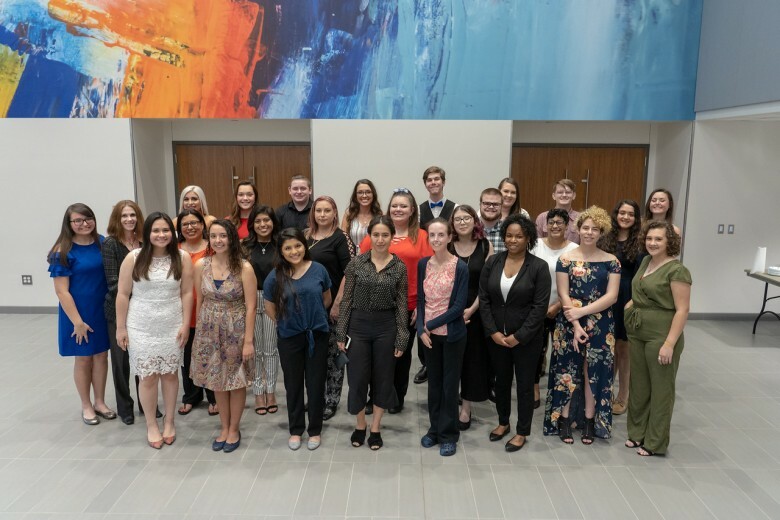 Inducted into PTK at College of the Mainland were Fabiola Alonso, Angela Andrews, Bellanira Arteaga, Madelena Ballard, Matthew Bell, Margaret Bledsoe, Dawson Boudreaux, Jocelyn Bustos, April Carrisalez, Cecilia Chackochan, Cassandra Ciminello, Kayleigh Cortez, Rachel Epperson, Carmen Flores, Karen Foreman, Taylor Gance, Chelsea Goffney, Hunter Guidroz, Brianna Holt, Carlee Jenkins, Mark Johnson, Alyson Keith, Brooke Lading, Noah Lindsey, Kailey Matejka, Haley Mckinney, Mason Moran, Brittany Mullins, Crystal Nunez, Tekeema Oliver, Tobias Oliver, Cadalese Ortega, Myra Qamar, Alixandria Oquendo, Ginger Pace, Meryem Patranella, Ashley Pretty, Maribel Robles, Olivia Rodriguez, Ileana Salinas, Clay Sheppard, Stephanie Smith, Demi Todaro, Sierra Torres and Cassie Wilcox.